I have been thinking for a while about a way to introduce my wonderful teaching partner, ECE Pooneh Haghjoo. This year has been fast-paced and action-packed, much more than any year since perhaps my first year of teaching (hence a long time since my last post). Although in some ways this year has been the most difficult in memory, with issues and events popping up to complicate the usually busy but joyous job of teaching, I've had many moments of looking over at my partner and thinking: "How did I get so lucky?" Transitioning to FDK has come with many challenges, and not the parts that I anticipated being difficult: the project-based learning from following children's inquiries that our school board and our Ontario curriculum document support is a big part of our K team's culture. Learning to work around sharing the yard throughout the day with 3 other classes and more planning times to consider, more kids/less materials/equipment/space with large classes, among other items on the learning curve. Not difficult this year: finding a way to share the space I'd made my home over the last two years. I'd been told it can be something like a marriage, in that two people share intimate quarters, materials, kids and important responsibilities. I imagined I would be hard to work with: I'm always making plans based on kids' interests and questions, then throwing those plans (and assembled materials/provocations) away or aside when a more powerful learning experience comes up. I've so many loose threads on the go, like my browser which always has at least 5 tabs open... I'm not the calm, quiet one in the room. I'm excited about life and learning. I'm passionate about the environment as third teacher and learner collaboration as the key to inquiry. I'm also loud, often provoking students with musical or noisy invitations to play. I'm happier outside than in, especially because I believe I see the true personality of children when all of their senses are fully engaged in learning, which is much more possible outdoors in every season. Over the summer I engaged in losing myself in the big, beautiful outdoors with my family. The growth in my kids, especially over our 2 weeks visiting family and friends in BC (shared in this earlier post), was incredible to me. So it was with some trepidation that I returned to school where we were entering our first year of FDK and me not knowing my partner's name or anything about him or her. In some ways, it was not unlike moving schools like I did three years ago when I left RJ Lee PS in the north after eight years in the same spacious Kindergarten classroom. My commute was a long one but it was hard to leave a community, both my colleagues and the families of students, some of whom had two and three siblings join my class over my time there. I fell in love with the people, but also fell in love with the tree-lined creek that snaked past the school on our north boundary. Walks along the path were "trips to the jungle" and "forest adventures" to my students. We saw cotton-tail rabbits, geese and mallards aplenty, and even a pair of wood ducks one summer day. We went often to "visit our ducklings" every spring. And watched them grow from fuzzy yellow balls that "peep!" through the awkward fuzz and feather stage, always running after "mama duck". We peeked at the school through breaks in the leaf cover, and felt like no one could see us. Leaving RJ Lee was difficult for all the reasons mentioned above, but for me, having grown up in the countryside with a swimming pond and forests to wander in, leaving the little piece of wild behind was really hard. I couldn't imagine finding anything like it anywhere again. It's not that different for our students, coming to our classes as their first experience of school. What will it be like? Will I make friends? Will it be safe? Will I have fun? Will I know what to do? Moving to Thornwood PS, I was delighted to discovery it was bordered by Cooksville Creek, and that it has the unique "no-mow zone" wild learning area just across the field from our classroom windows (described in this post). Likewise, while I was eagerly anticipating finally joining FDK, I was full of doubts and questions. Last year I had asked Tessa Heffernan, (a PLN friend whose outlook on the learner as capable always shines through in her writing) if she would share what makes her partership with Holly Diljee such a rich and rewarding relationship for the both of them. I was so touched by the obvious love and respect in the post, and it both inspired and worried me. How likely was it for me to be placed with someone who I could see eye-to-eye with on daily matters and big ideas? Tessa's words below, taken from her guest post (see here) really summed up what I had found with the OCT team at Thornwood over the last year, and what I really hoped would be possible with our new ECE partners. I’m going to be honest and say that we simply lucked out when it came to similar philosophies. 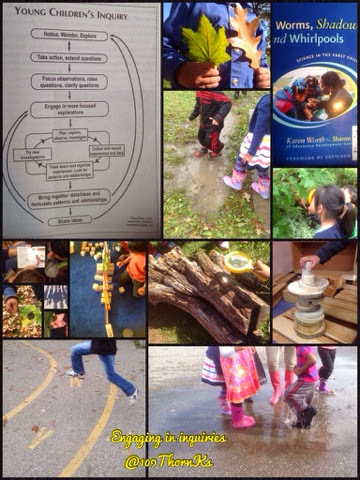 We both are huge proponents of open-ended materials and activities, uncovering the curriculum through play, emergent learning, a natural and warm environment, choice, supporting and promoting self-regulation, building relationships and teaching skills as opposed to discipline, and making developmentally appropriate decisions. These goals allow us to constantly focus on the ‘why’ behind our decisions. If a school-wide activity comes up, we make a decision about participation based on our philosophy. If we are considering a provocation or activity, we think about how it fits or does not fit with our programming. If children are taking part in an “outside of the box” exploration, we generally ask ourselves two questions: 1. Are the children being safe? 2. Are the materials being respected? It's hard to believe now, only a few months in to our time sharing a classroom, but I feel like Tessa's words ring true for me in so many ways. Pooneh has a wealth of experience as a teacher first (back in Iran) but also ECE experience in Canada with early years teaching, mostly with toddlers. Her obvious love of the students is clear to all: our parents, students, and all staff at Thornwood. Her way of reading students' body language and participation to know when it's time to change our routine, our set-up or even simply the story being read aloud? She is a consummate teacher, always listening carefully to the students, looking closely for themes emerging that she can extend. She is patient with young students who say: "I can't" even when they very likely can. She is as fascinated with the way kids think (including their interesting wrong conclusions to experiences) as I am, which belies a powerful belief in kids as capable learners with gifts and ideas of their own. She is patient with allowing students to struggle when it will lead to greater understanding, but also willing to help when a tired child is past their ability to persevere. In short, Pooneh embodies the model of scaffolding learning in her approach to teaching. I wound up with a partner as solidly convinced about the rightness of emergent curriculum as I am. Her sense of humour lifts me when I'm frustrated with some mundane issue after a busy day. Her joyful embrace of experiential learning, the aspect of a partner I was most worried about? It shines through in her words, actions, and daily documentation of our students learning together. At first I wasn't sure how to add a second user to our class twitter page, so I would simply retweet her posts onto our class page (as some of those I've included here). 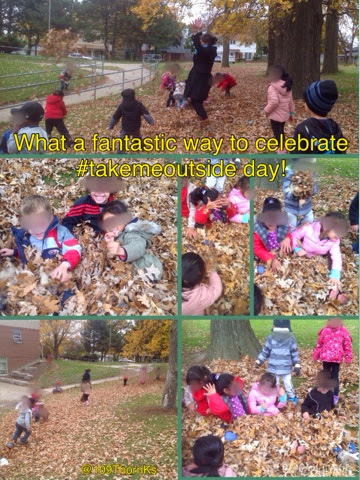 Now that we share the account as authors, I find myself looking at our page and grinning when I see a new post of a moment I witnessed from across the room (while I was engaged with other students) or often not present for (while one of us takes a group for walks as the other teacher remains in the kindergarten yard with students using outdoor equipment). I appreciate how she sees the growth of individual children as well as the bigger ideas unfolding in their play within groups. It makes me think of how rich our reports and interviews will be, looking at the wealth of observation and documentation she brings. I love the way she captures the joy on the students' faces: though we obscure faces to protect student privacy, the grins are evident in photos of experiences inside and out of the classroom. I also grin when I see a post "faved" by our own account, knowing Pooneh has just come across something I shared that she finds delightful. Below are just a sampling of tweets that show the joyful learning that my partner has captured this year. September 17th was "International Flip a Rock Day" and I knew whatever else came our way, I had a partner who saw the value of free exploration outdoors. "Look Closely" truly became the culture of my classroom last year when I was still 1/2 day (and thus no teaching partner at the time). It was obvious pretty quickly that Pooneh sees the magic in the littlest moments, too. The above tweet shows one of Pooneh's many projects undertaken to answer a question or spark from one of the children. It may have grown out of this noticing by several children much earlier on. (tweet below). One of Pooneh's many invitations for students to explore materials using their senses. No explanation (of above tweet) necessary. Pooneh and the kids playing under the oaks. I captured these four girls playing with Pooneh in the cubby while waiting to be picked up at the end of the day: "We are drumming on the table that we worked so hard to clean" say JP and EW (click for vine clip). Another delightful moment in the day occured during our long "Play & Learn" block in the morning. Students playing with the medical tools from the class "Veterinary Kit" decided to take care of Pooneh instead of animals or other student patients. I wonder now if it was because of the morning conversation at welcome circle when she shared she wasn't fond of the cold weather. She waved at me, holding her "prescription" from one girl: a trip to the beach was the doctor's order. More prescriptions followed. I know that our story has just begun, and that much learning will occur before the year is over. I have much to learn from my partner and it is still early enough in the year that we continue to tweak our schedule and environment in order to meet our students' learning needs... but I am confident that from now on, classroom stories will be "our stories". I am extremely grateful for my partner. From there, much is possible. Addendum: when I see the way all the Kindergarten classes have grown over the last few quick months, I'm truly pleased that our new ECE partners are equally on board with the adventure of child-lead, play-based learning as our OCT team are. I often fave tweets from both ECEs and class accounts (some are sharing account like Pooneh and I now do, other classes retweeting from ECE as we did) and I'm delighted at the rich conversations taking place between classes and over lunch in the staff room. Though our school experienced a painful loss this fall that touched us all (deeply felt in Kindergarten), our team is so full of passionate teacher/learners that I expect we'll continue to meet all challenges as a family. I feel incredibly fortunate to work with my Thornwood PS colleagues. A gorgeous post that gave me shivers and a clear glimpse into the incredible relationship the two of you have built. I think what stands out most clearly through your writing is that you are both able to be your true and genuine selves together. Thanks, as always, for your kind words about my own journey which always seem to re-inspire me. Thank you so much! I have to tell you, I re-read your post every once in a while, and every time something else jumps out at me, or more likely settles in more deeply... it's meant so much to me to have you and Holly to look up to as I began my FDK journey. How lucky I am to have you, and Pooneh, and our fantastic Thornwood team. "If children are taking part in an “outside of the box” exploration, we generally ask ourselves two questions: 1. Are the children being safe? 2. Are the materials being respected?" To be honest, we use those as guidelines with the kids too: we have two guiding rules for participation in our class: respect for the people in the class, and respect for the materials in the room. I think we may have used the word safety, not respect, but the message is the same. Thankful for all my teachers, from those in my room to those afar but close at hand in our PLN.